Accommodation has been reserved in close proximity to the Perth Convention and Exhibition Centre with special conference rates when booked through All Occasions Management. Accommodation rooms are limited and allocation will be strictly on a first-come first-served basis. The accommodation availability and prices shown are current at time of publication, however, they are subject to change without notice in accordance with the terms and conditions of each supplier. Please book your accommodation as soon as possible to avoid disappointment. Please ensure that you read the terms and conditions carefully before completing your booking as terms differ for each hotel. Review the accommodation options below and then click the following link to book your accommodation at the special conference rate. 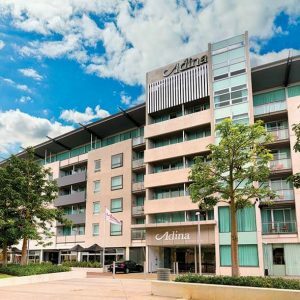 Located steps from the Perth Convention and Exhibition Centre, Adina Apartment Hotel Perth is the perfect base to explore Kings Park, Perth Arena and the Swan River. Access public transport easily with Elizabeth Quay station is also 3 minutes away. 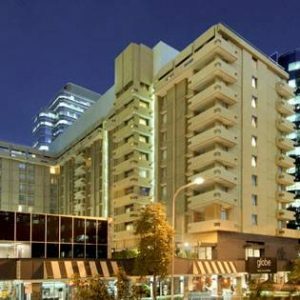 This Perth CBD hotel featuring free WiFi, is the ideal destination for corporate travellers, minutes from the main office strip of St Georges Terrace where you can find BHP, Brookfield Place and QV1. The apartment hotel also hosts meeting and events spaces featuring natural light. For families, enjoy the revitalised outdoor lap pool, fitness centre and close proximity to the Riverside Theatre, London Court, Hay Street and Murray Street Shopping Mall, His Majesty’s Theatre and Forrest Chase. Cancellations received between 30 – 15 days prior to arrival will incur a cancellation fee equal to one night’s accommodation. Any cancellations made within 14 days prior to arrival and no shows will incur a penalty equal to 100% of the total accommodation booked. 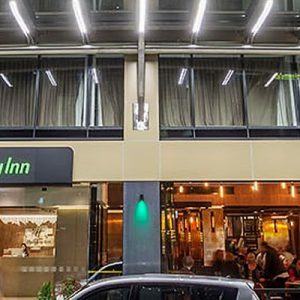 Holiday Inn Perth City Centre puts you in the heart of the Perth CBD. Our central Hay Street location is within walking distance of the city’s main attractions, business district and retail precinct. Step out the front door of our hotel and everything is at hand. This is just one reason Holiday Inn Perth City Centre is Perth’s best hotel. At Holiday Inn Perth City Centre you get the best of both worlds – 4 ½ star facilities, professional service and stylish accommodation, plus a warm and friendly atmosphere. Whether you are travelling on business or leisure, you can feel relaxed and comfortable at our Perth CBD hotel so you can simply be yourself. 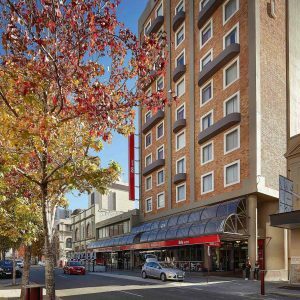 Located in the Perth West End, ibis Perth sits just 300m from the Murray and Hay Street shopping malls. The hotel bistro serves great-value meals daily, and guests can relax after a busy day at Rubix Bar, which offers meals and drinks, and bursts into life on weekends with a real party atmosphere. Situated on the doorstep of Perth’s city centre, ibis Perth offers easy accessibility to many of the city’s top attractions. The Swan River and Kings Park are within easy reach, as are the Perth Entertainment Centre, the WACA and Gloucester Park race track. For guests looking to explore Perth’s beaches, head to City Beach or Cottesloe Beach; those with kids can check out Perth Zoo or Adventure World; and those looking for retail therapy can head to Murray Street Mall, Victoria Park or Perth CBD. Cancellations received within 30 days prior to arrival will incur a penalty equal to 100% of the total accommodation booked. Situated at the stylish King Street end of Perth’s CBD, surrounded by chic cafes, trendy bars and boutique fashion stores, Mantra on Murray is the perfect base to conduct business or explore all this diverse city has to offer. 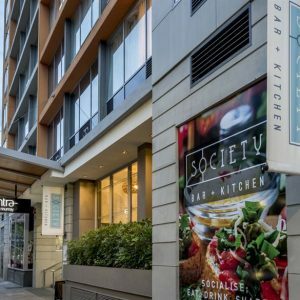 Mantra on Murray is perfectly positioned within easy reach of Perth’s top attractions including Subiaco Oval, Burswood Casino, Murray St Mall and for corporate travellers, the St George Terrace business centre is just a block away. 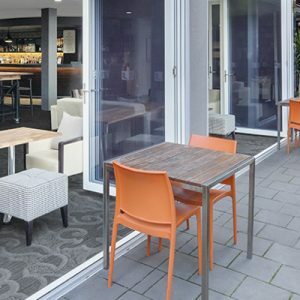 Our contemporary Perth hotel is located only 20 minutes from Perth Airport and features modern studio style rooms boasting fully-equipped kitchenettes, lounge and dining areas, LCD televisions, Foxtel and in-house movies. 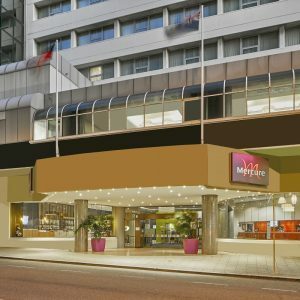 Set in the vibrant cultural and business district of Perth CBD, Mercure Perth is an excellent choice for every imaginable kind of travel in Western Australia. Take in sweeping views of the city and Swan River from the rooftop pool. Relax in stylish, contemporary accommodation with friendly and personalised service. Enjoy fresh, locally sourced cuisine and inspiring cocktails at Beccaria Restaurant. Feel like exploring the local scene? You’re just a short stroll away from the city’s best offerings, such as the waterfront entertainment of Elizabeth Quay, famed shopping along Murray and Hay Streets and priceless works at the Art Gallery of Western Australia. Getting here is easy. Mercure Perth is close to Perth Airport, the city’s central train station and Perth Busport. Located in the heart of the city, Parmelia Hilton Perth provides the ideal home base for business and leisure travellers. Our hotel features a special collection of artwork in addition to comfortable guest rooms and suites. – Sizzling steaks and seafood at Adelphi Grill, open every day – Fitness centre and outdoor pool – Complimentary WiFi throughout the hotel – Adjacent to Perth Convention Exhibition Centre. Please click HERE for accommodation terms and conditions.